Yes, Apple should make a small, compact, lightweight, moderately rugged notebook computer. No, it shouldn't be a netbook. Apple should follow Sony's lead and introduce a netbook-sized notebook computer that defies convention - which is exactly what Sony did with the Vaio P, a subnotebook it refuses to label a netbook. The Vaio P is a beautiful 8" subnotebook that weighs just 1.4 lb., is just 0.78" thick with a 4.72" by 9.65" footprint, has a chiclet keyboard like current MacBooks, has a high resolution 1600 x 768 super-widescreen display (that's a 25:12 ratio! ), comes in a variety of colors, has no trackpad (or room for one) and starts at a retail price of about $900. That's twice the price of a netbook. 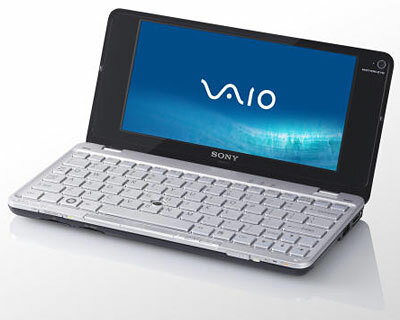 The Sony Vaio P - don't call it a netbook. There is no formal definition of a netbook. It's most common characteristics are that it is smaller and cheaper and less powerful than a 12" notebook. Most have a 1.6 GHz Atom CPU. Most have a 7" to 10" display, weigh 2-3 pounds, and sell for under US$400, although a few cost a bit more. Netbooks aren't designed like regular notebooks, which have 12" to 18" displays, full sized keyboards, dual-core CPUs, and weigh quite a bit more than 3 lb. Most notebooks are designed to give you most of a desktop's power in a portable package, while a netbook is designed to give you sufficient power to get by. The Vaio P is lighter than your typical netbook, and its hi-res 1600 x 768 display is much higher - netbooks range from 800 x 480 to 1280 x 800, with 1024 x 600 being the most common. Sony realizes that the netbook label implies certain things about price and features, and it has created a premium alternative to cheap netbooks. Were Apple to enter the subnotebook market, count on it to do the same thing - and to make few if any compromises in comparison to the MacBook Air (MBA) and the low-end polycarbonate MacBook White. First of all, Apple would build its "MacBook Lite" around a Core 2 Duo Intel CPU, not a low-end single-core Atom chip. I'd guess a base clock speed of 1.6 GHz, which would give it as much power as the MacBook Air and twice the power of the typical netbook. There would also be a 1.86 GHz build-to-order option or a top-end MacBook Lite (MBL) with that as its default CPU. Knowing Apple, it would retain the chiclet keyboard already in use on all of its notebook computers, and a backlit keyboard would either be a build-to-order option or standard on a "better" version of the MBL. I'm guessing using that keyboard would give the MBL a minimum width of about 10.5". Based on eight years of PowerBooks just 1" thin, I would expect the MBL to be no thicker than that if it's made of aluminum, perhaps 1.08" in polycarbonate (same as the MacBook white). The third dimension would depend on the display. I wouldn't expect Apple to go as widescreen as the Vaio, nor would I expect to see it build an OS X computer with a 600-pixel-high display. That's not quite enough, as anyone running OS X on a clamshell iBook will attest: It's usable, but it's tight. I'd guess 720 pixels as a minimum height, with 768 or 800 more likely. The same 1280 x 800 resolution as the current MacBooks would be wonderful, and either 1280 x 768 or 1280 x 720 would be acceptable. Going beyond 1280 pixels horizontally would probably raise the cost of the MBA, although that again might be a built-to-order option. Figure on a 10" to 11" screen - 12" tops. Let's assume Apple would use a 10" display and a slightly smaller version of the glass trackpad found on all the aluminum MacBooks. This would give us a footprint of about 7.5" (8" tops) by 10.5" - right in the same range as many 10" netbooks. If Apple is serious about pricing the MacBook Lite to impact the market, it will use a 2.5" SATA notebook drive rather than the most costly, lower capacity 1.8" drives used in iPods and the MBA. Although similar in size and weight to a netbook, the MacBook Lite would be a serious subnotebook computer with dual-core power, Nvidia GeForce 9400M graphics, a higher resolution display than most netbooks, a full sized keyboard, AppleDesign, and Mac OS X.
Apple sold almost 6.5 million notebooks in 2008, and even in a sluggish economy we can expect that number to grow in 2009 - maybe by only 20-25% instead of the 37% to 65% of recent years, but grow nonetheless. Assuming 20% notebook sales growth, that would have Apple selling 7.8 million notebooks in 2009. Earlier this month Frank Fox posited that the current netbook market is too small to interest Apple, although that could change in coming years. Industry figures project that netbooks will accounting for 17.2% of all notebook sales in 2009. Apple has its own ecosystem, and the lack of a Mac netbook has created a bit of a boom in Hackintosh netbooks. A MacBook Lite would probably cut into that market, even if it cost twice as much as the typical Windows netbook. After all, it would come with Mac OS X, the iLife software suite, AppleDesign, and everything would work out of the box - no issues with WiFi cards, ethernet ports, etc. not being supported, as is the case for most netbooks that have OS X installed. Let's say that Apple delivers a MacBook Lite at the start of April. With its small footprint, it would be of immediate interest to Hackintosh netbook users, 12" PowerBook and iBook users, and potential netbook users. There would be a solid demand in early months, and it might account for as much as 20% of Apple notebook sales during its time on the market. This won't come without a price. Some potential MacBook Air customers would choose the MacBook Lite, as it would offer the same performance in a less costly package. And if Apple prices the MBL aggressively, it would very much eat into the MacBook White market. In fact, my suspicion is that if Apple were to sell a MacBook Lite at US$999 or less, it would gobble up most of the MacBook White market in short order, leaving Apple to unload them to people who need FireWire or a low-cost notebook with a built-in optical drive. Were Apple to introduced a MacBook Lite at this price point, I'd estimate that it would grow the total Apple notebook market by 10%, which could raise 2009 unit sales to roughly 8.4 million units (since it missed the first quarter) - and the MBL might account for 1.25 million units this calendar year. The polycarbonate MacBook White would be phased out before the holiday quarter, as its market would virtually disappear in the fact of the MacBook Lite. This would also eliminate the confusion of having polycarbonte and aluminum models bearing the same MacBook name. Apple would not so much be fighting for a piece of the low-margin, low-cost netbook market, but offering its own solution to demand for a subnotebook within the Macintosh ecosystem. Instead of fighting for 10-15% of the total netbook market, I see a MacBook Lite as creating a new market where there is currently no Apple presence. There is no better time than the present to launch the MacBook Lite. It would create a lot of publicity for Apple, helping to grow the overall Mac market. It would cater to the needs of those who want Mac OS X on something with a smaller footprint than the MacBook and MacBook Air. It would generate a new market for the existing Apple USB SuperDrive. It would provide processing power not seen in your typical netbook. And it would be profitable. What it wouldn't be is a netbook.